All is not what it seems. Image from here. 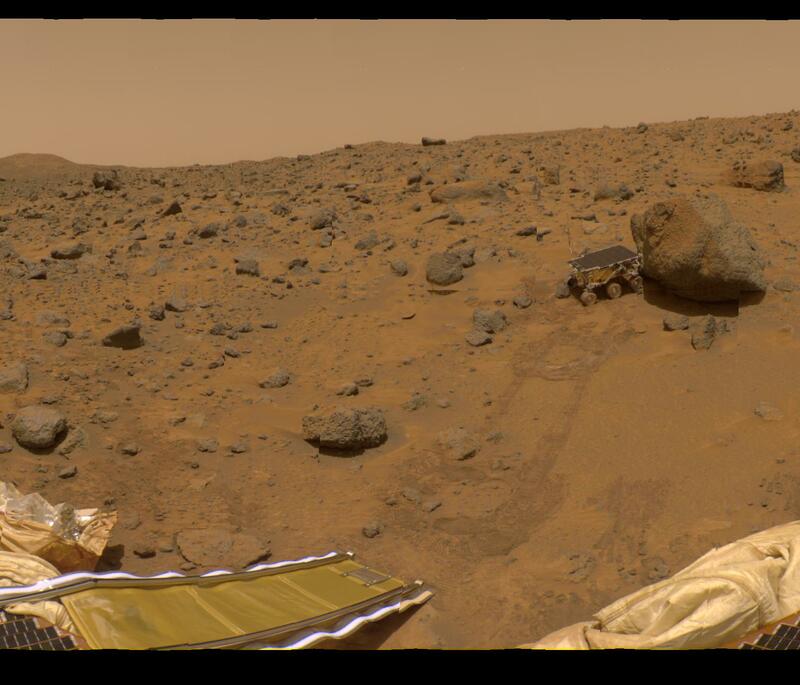 Spoiler alert: The Martian did not land on Mars. There are two reasons why this claim may be difficult to accept. First, some may find this claim difficult because of the source. I appear in the movie theater as often as a lunar tetrad. Honestly, the last time I sat through a film, it was probably made of film. I lack Hollywood cred so if you are skeptical, I get it. Second, some my find this claim difficult because they believe that Matt Damon (with his baby face value and public statements of late) is a Bourne-again Baptist type. Guys like this can be deceived, but are not deceptive. You are thinking: how can such a clean cut, gun-toting American be a part of another conspiracy? (And no, he didn’t go the moon either). I urge you to push past these difficulties. The whole thing is a hoax. In advance of the release of this film, I have spent considerable time avoiding real work by studying internet trailers and a few published stills. I have zoomed in on reflections on glass and metal. I have mapped faint star patterns in the sky. I have even calculated wind speed and direction on the basis of a flag flap. In the end, it just didn’t add up. Then it hit me: the Wadi Rum. Ridley Scott’s “red planet” can be visited by means of Google Earth. It is located directly east of the northern tip of the Gulf of Aqaba. To view, plug in these coordinates: 29 34 48 N, 35 25 23 E. Image courtesy of Google Earth. The Wadi Rum is a desert region of southern Jordan near the Saudi border. It is a remote area known for its austere beauty. Rocky islands rise from a sea of red sand. Geologically it is fascinating. Here, rocks formed by fire meet rocks formed by water. The basement of the Rum is exposed granite, an massive igneous layer that carries the entire Arabian plate on its back. It is the oldest rock in the Middle East. Clinging to the granite are layers of colorful sandstone. Some would even call it 350 million years worth of ancient seafloor. White quartz sand dominates these sedimentary layers. It is tinted by the cement that holds the tiny crystals together. Because this cement is loaded with various metal oxides, particularly iron, the region has a distinctive reddish hue. It makes for a lovely Martian-esque environment (a fact not lost on Ridley Scott in his production of Promethius as well). My dear Vicki stands on the sandy floor of the Rum with the “Seven Pillars of Wisdom” to her right. This towering rock formation, weathered into vertical fingers, is one of the most distinctive landmarks in the region. No worries my love, help is a mere 140 million miles away. We won’t leave you behind. This color-me-beautiful aspect of the region was not lost on the biblical writers. Southern Jordan is associated with the character of Esau in the book of Genesis. Besides being a rather furry fellow, another distinctive is his hue. Edom in Hebrew carries the meaning of “red.” The nickname stuck. Esau may be the original “Martian,” a red man living in a red land. For the modern adventurer, the Wadi Rum is off the beaten path. However, for those who visit the ruins of Petra, that “rose-red city half as old as time,” it is within stabbing distance. Attractions include the “well of Lawrence (of Arabia)” the famous British chap who helped stage the Arab Revolt of WWI, a lovely Nabatean temple from the New Testament period, and, of course, a majestic silence broken only by the whistling wind. Camels in the Wadi Rum. For a full experience of the Rum, one must also take a camel ride into the desert. To enrich this (is that possible? ), an overnight campout is a once-in-a-lifetime experience. Clear night skies, far from all light pollution, disgorge a million stars, and, if you know where to look, maybe a planet or two, including Mars. 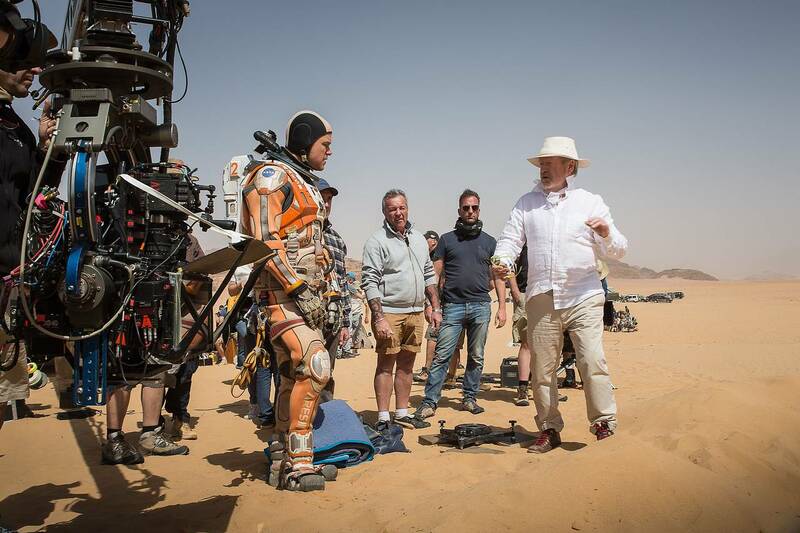 Matt Damon receiving instructions from Ridley Scott. I don't buy it. If this were really Mars, wouldn’t they be writhing on the ground, choking on their own tongues? Image from here. While doing this careful research I encounter a photograph of Matt Damon visiting Petra. He wanders through granite and sandstone massifs sporting a New England Patriots cap. I investigate his Boston roots. My hunch is confirmed. Don’t be fooled. 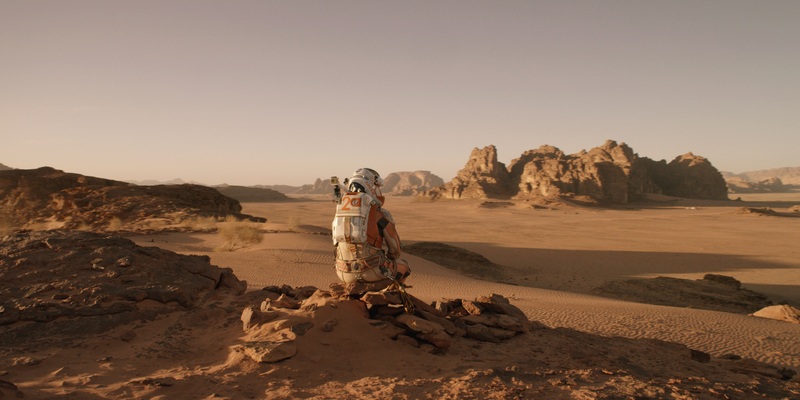 Matt Damon has star power, but he never made it to Mars. He was castaway in southern Jordan. Moreover, the fact that he is a fan of a football team coached by a Sith Lord forces the conclusion that Damon is no Bourne-again Baptist. He is a compromising Congregationalist at best, a deflated Deist at worst. I hope I have not burst your bubble. I plan on seeing this flick this weekend, hopefully in 3-D. I'll try not to think of Jordan. And in the future I promise not to reveal the location of Skywalker’s Tatooine. Behold the true surface of Mars. I think the little guy is stuck. Thanks, NASA. Image from here.